Tablet01.Siberian Chunder tablets. Translations included. L01. 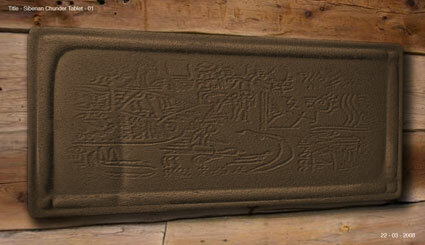 Tablet 01: This was the first tablet to be found at the secret site in Siberia. Note the superb condition, with only minor environmental wear around the periphery, where some details have been lost to the naked eye. The material appears to be unfired fine clay of a surprisingly low density but with exceptional strength and rigidity. The form is simple with a raised edge to obviously protect the imagery/symbols. We believe that the marks were made with a stylus whilst the clay was in a plastic state which has since become hard. L01./1 From top left hand of the tablet we managed to reconstruct this detail using a deep scanning imager and a pattern recognition algorithm. First impressions appear to show some form of light or radiation emitting from a body with 3 smaller satellites (one much larger), the triple wavy lines may signal some sort of radiation with the four straight lines indication movement or direction. The three curved lines connecting the four straight and 3 wavy lines appear to define a more stable region or some kind of rhythmic transmission. (Reconstruction is @90% accurate). L01./2 This symbol appears adjacent to L01./1 (We have not yet established whether the pictographic symbols read in any particular order.) And shows a ground plane with either plants, grass or possibly debris in motion upon which stands a figure  Bipedal, either with minimal neck or wearing some form of helmet. We believe the semi anvil-shaped side attachment is not a deformed limb but rather shows a tool or some kind of strapped on attachment. L01./3 Here we are into pure cryptic symbology. This symbol is to the right of symbol two (S2). If they are associated then we could assume symbol three is a modifier or a time based serial explanation of some form of activity or action of the figure in S2. In short it could be repeated ground lines symbolise travel overland to a destination approximated in the oblong shape. The oblong could be some form of building or entrance to another environment. There are no marks within or "on the other side of the oblong", which would translate to no knowledge of the environment on the other side. L01./4 Symbol 4 is adjacent to the right of S3. We've been studying this symbol for 2 days now and can come up with no identifiable translation features except that there is a square apparently sitting horizontally on top of some hill or mound. We expect this symbol to be meaningful to the author and his group as some kind of accepted place in a geographical area  A ritualistic mound of some kind? L01./5 This symbol could be translated in many ways: a) The ritualistic dragon favoured by our Chinese translators - the triangular nose, the round eyes, the motion lines of some matter leaving the mouth, the decorative features at the side of the nostrils and the shading on the cheeks. B) An encampment on the top of a hill. Or c) A personal figurative symbol of the artists mind. We have no symbolic reference we can rely on in this case. L01./6 We have assigned this symbol with a technological bias. Note the 4 circumferential rings around the main body of the symbol. The irregular spacing of the first ring from the second third and fourth rings shows a definite purposeful arrangement for a required result. Two of the translators believe this to be the clinching symbol denoting a technical ability of the artist or culture that produced these tablets. There is a strong similarity to an electrical/electronic component, it can also be seen to have a strong resemblance to a linear magnetic field generator. L01./7 All the translators concur on the logic behind this symbol. There are two circles representing similar circumstances or existences that are divided by an area of turbulence or discord. A strong and stable zone exists to the right of the other three components to this symbol. The desire to journey from the middle circle to the left hand circle is indicated in this symbol. L01./8 We believe this symbol (adjacent to S7) describes a desire to travel [by what means we do not yet know], possibly by three subjects. The five symbols in the larger column representing the items required for the journey. Taken with S7 the two together are a strong indicator for travel. L01./9 This symbol shows a sturdy pack with the contents iconographically showing through the material. Viewed with the two preceding symbols this adds weight to the idea of travel as an early part of the tablet translation as a strong possibility. L01./10 A diamond decision box containing a vertical bar with weights on either and mirrored ends establishing a block to the movement of the icons on either side of the bar. This symbol we believe is the same as a balanced equilateral equation in maths shown in a iconographic form. The individual marks within the box referring to individual components of the equation/decision which this symbolises. The dots to the top left are either elements of the build up to the decision or the result of the decision (Will know when a direction of reading is established). L01./11 To the right in symbol 11 are 2 figures, one of which appears also in S2. To the bottom left of this symbol are what appears to be three prostrate figures (possibly expired?). In the upper left quadrant is a sub symbol that shows some kind of oblong connected to a crescent moon or possibly a crescent wing passing through an oblong window. The middle figure is connected to the three prostrate figures by 3 jittery lines  either trying to help or, terminate them. Another explanation by one of our translators is a vampiric action by the middle figure. The right hand figure is inn active in this context  a witness if you like. Taken as a whole the interpretation is one of a traumatic event preceding a journey  some kind of quest in the making! L01./12 Almost equates to a technical drawing showing an iconographic mountain or mountain range and a moon or satelite that may be sending or radiating materials to the mountain range. The basal lines in the bottom middle are reminiscent of dimension marks on a design draft. The two x's in the centre plane signify definitive objects. This symbol could be a plan of action being described, for future action. L01./13 The satelite in S12 is also connected to the rest of Symbol 13 shown here. Again as in S1 the wavy lines symbolise radiation (Harmful or not we do not know) and also when set at 90° is indicative of a barrier. The wavy line and circle in the middle right we believe is a value and an identification of a technical problem. The eye shown below this is understood to be wisdom or knowledge. The two and a half wavy lines at the base with a circle for a fulcrum or balance point indicates some form of choice is in the balance. L01./14 Symbol 14 is split into two halves  the left hand being descriptive with the right hand being some form of organic formulae. Fluid and radiation icons are both contained. It is not possible to translate exactly the form of the result of this formulae. We have not yet been able to define a numeric or value system within these symbols. L01./15 This is strongly suggestive of the act of transport. This symbol is reminiscent of the God Apollo (The sun god of ancient Greeks) riding his sun chariot across the heavens. The figure appears in the earlier symbols  S2 and S11. There is no representation of the means of propelling this vehicle, it is also open to the elements which is an indicator of a low technology civilisation. L01./16 A rather puzzling symbol! Could be a road to travel with snakes as a danger  or pretty much anything else you can think of. We believe the size of the single curved item of this symbol bears on the importance in the story of the tablet. Again we have a three time repeated item, apparently pointing to some task related to the large curved item. Notice the dots in the bottom left hand of the symbol, we are beginning to believe that these represent some form of numeric or measurement system. This one has perplexed us, we hope that a study of the other tablets will bring a reference we are able to use to understand this symbol. L01./17 The double X's reappear in this symbol (The x's we believe now represent two characters in this Tablets story), this time they are separated by two horizontal lines, which we are interpreting as a distance between the two subjects. To the right of the two X's at the top we have 3 small horizontal lines which are in proximity to the circle (A representation of a moon or planet?) And below this are three more X's. If the previous translations are correct then this means a plan to travel to or past the moon symbol by the three figures. To the right we have more symbols which appear to be some form of identification of possible problems to the aforementioned plan. The lower half of the symbol contains three crescent moons and various triangles lines and crosses with a chevroned lazy line  an obvious statement of a time window for the plan to be put into effect with various unknown problems being stated. This symbol is a very strong statement of intent with a time window and associated hazards defined. L01./18 A busy but unfinished looking symbol. It looks as though the idea incorporated into this symbol has been cut short, a space was obviously left to the right hand area to complete this symbol ( We strongly believe these symbols have been written from left to right). The moon or satelite icon (with a centre circle this time) appears to be hovering over a plinth and is dropping or evacuating something onto the plinth. The two X's appear again underneath the plinth separated by two vertical lines (Symbolic of the main protagonists in the story of the Tablet). The two horizontal lines below this are now believed to at and for the land we stand on, or something of a similar nature. The centre third of this symbol is taken up by an obscure but hurried and incomplete diagram or drawing of unknown nature. An incongruity appears at the bottom of this symbol  the English letters ROMM seem to be written. This is completely aberrant to the rest of the find on the Siberian site and may point to a fake tablet, though we think not. Every other indicator points to these tablets as being consistently the real thing. We will of course be looking further into the apparent incongruity of the English lettering on this symbol.